07 | April | 2018 | Azazel's Bitz Box. It looks like Squad: March had a decent uptake last month, and we’ve had quite a few people complete the challenge. Yeah, I know a lot of them were things that people were going to be painting anyway, but any motivation to help get the models done is kind of the point, and it’s always fun to have a round-up where people get to see each others’ work. We start this month’s showcase with Mark Morin‘s effort. He’s completed an entire platoon of OOP models, complete with power armoured support and a walker! 40 figures in all. Mark’s post chronicles the entire creation of these long-lost models, from packet, to planning, to completion. Well worth checking out. 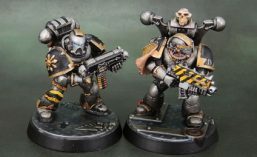 Backtothehammer’s Shadow Sentinels Primaris Space Marine Aggressors. Backtothehammer’s Shadow Sentinels Space Marine Devastators. Backtothehammer has been building his Shadow Sentinels Space Marines up for 8th edition, completing two units this month. Aggressors early in the month, followed by a squad of Devastators. Despite a bit of a struggle, Just Needs Varnish managed to complete the last figures for his Paraguayan Infantry Battalion in time, thanks in part to the rather lovely UK weather of the moment. I do understand though, that the figures still need varnish. Steinberg Shed Space painted a ton of troops for his Steam Wars Martian force. Sanwar Slave Infantry, Martian Cephalopods with their robotic retainers, and more besides. I highly recommend checking out his post with his full completed army-so-far shots, here. Krautscientist’s Inquisitor Nabreus Arslan and his retainers. Krautscientist’s retinue of Inquisitor Erasmus Gotthardt. Krautscientist‘s work on Inq28 retinues was also very productive this month, completing two. Firstly that of Nabreus Arslan, “The Lion of Velsen” and also the Retinue of Inquisitor Erasmus Gotthardt. Thomas’ Thousand Sons Rubric Marines. Thomas, from High Times on the Eastern Fringe completed a unit of Thousand Sons Rubric Marines, achieving a very nice, and appropriately cold feeling to them. My own stuff was highlighted in my last post, so I’ll just drop the group shot here at the end. Now, time for me to get assembling for April’s Challenge.